A couple of years back Patrick Muhlberger wowed us with his avenging uncle dance fight short Pop Music, so we’re overjoyed to tell you that he’s back on DN today with another full throttle combination of comedy and action in new short The Katy Universe – the story of a woman who believes she’s developed superpowers whilst at her friend’s wedding. Itching to find out more, we asked Patrick to tell us how the intimidating size of the universe led him to floating samosas, a cosmic monologue and a superhero battle amongst dinner leftovers. This idea kind of came from two different directions. On the one hand, I was trying hard to think of a story that would be easier to produce than my last short and I figured nothing could be easier than a monologue in one location. At the same time, I had read this article on the size of the universe and it totally terrified me. I became completely overwhelmed with a feeling of insignificance for weeks until I finally calmed down. 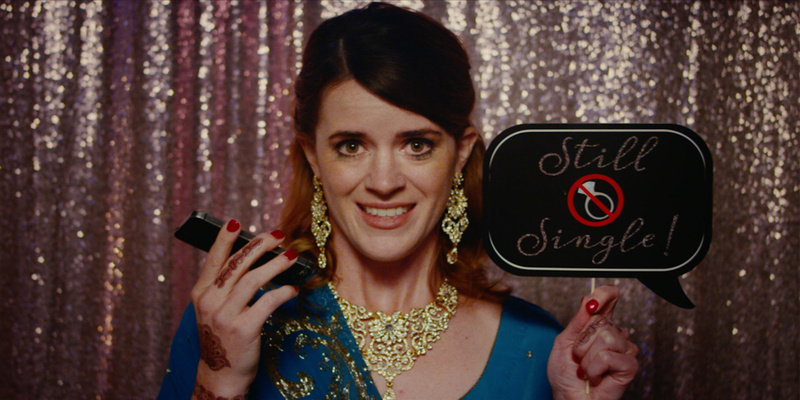 I began to explore this idea of meaning, combining it with some other experiences from my late 20s (Indian weddings, high school nostalgia, career confusion) and out came the character of Katy. The script was definitely not the easy and cheap idea I had set out to write, but Producer Sarah Haber was excited to figure it out so we pushed forward into prep. 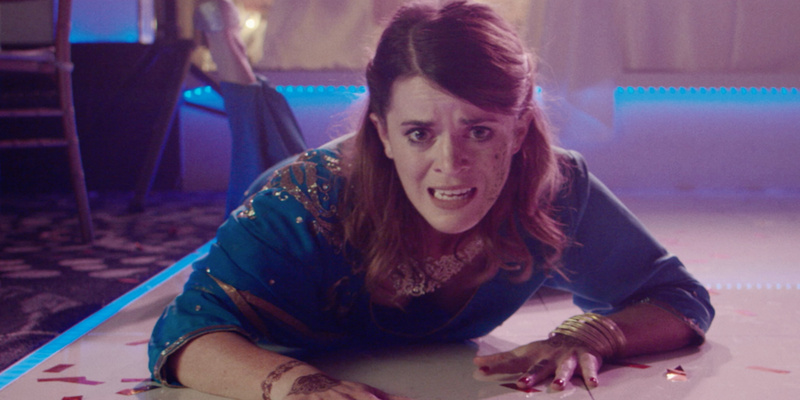 The whole short lives or dies on the lead’s performance and I was super lucky that the company JASH put me in touch with Mary Holland, who I’d been a fan of since seeing her on stage at UCB 8 years ago. With her attached, we had fight and dance rehearsals, tested VFX in Jonny Look’s apartment, and scouted pretty much every banquet hall in Los Angeles. We ended up shooting for 2 jam-packed days in December 2017. The shoot was a whirlwind. My style is pretty specific in terms of blocking and camera movement, almost like an animated film, so we broke up the monologue into chunks and shot it fairly chronologically, which helped with all the destruction continuity. It was a tight shoot and we barely made it, even with a second unit picking up inserts when possible. While we were shooting the climax with Mary standing on a table, the rest of the crew was lying on the ground, cleaning in between setups so we could avoid going over on our location. My style is pretty specific in terms of blocking and camera movement, almost like an animated film. We shot on a RED Dragon with Scorpio anamorphic lenses and used a device called a Skater Scope to do the spinning shots that symbolize her changing mental state. We used a Ronin2 from DJI for the explosion sequence but otherwise lived on a dolly. Special props go out to DP John Veleta for nailing all the camera moves and light cues that I love so much. The edit took about 6 months of nights and weekends while we tried to find the right balance between comedy, drama, and superhero movie. Editor Joshua Cole did a great job, making sure Mary’s performance was the backbone of the entire piece while still keeping it moving at a fast pace. The hardest part was definitely the panic attack sequence where we cut to the universe. We did about a million different versions, wanting to make sure the audience understood what was happening but also wanting the universe to feel huge and massive and overwhelming. A lot of people helped out to make this piece a reality and I’m so thankful. From VFX to composing the music to helping us clean up, making short films is always a massive challenge and it’s great to have so many people willing to give their time and energy for a weird little movie like this. A far cry from the easy idea I intended to write, I’m really proud of the final product. It’s definitely the most personal thing I’ve ever made, but also has floating samosas and a joke about foot jobs, so hopefully there is something in it for everyone! The Katy Universe is one of the many great projects shared with the Directors Notes Programmers through our submissions process. If you’d like to join them submit your film.